I met a WWII veteran a few days ago. He is J. Kenneth Brody, Yale ’44. I met him only briefly, but heard a lot about him from a family member. He hurried up his studies in order to serve. He joined the Navy and then served in three theaters of battle. He was at the helm of the lead destroyer that transported President Roosevelt to the Yalta Conference, which shaped the post-War landscape. “What a hero,” I said to his daughter. “He doesn’t think he is one,” she said. 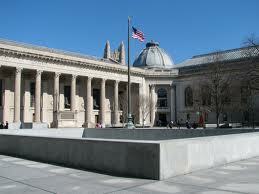 At Yale, there’s a place called Memorial Hall. See left, for a photo. As a student, you go through it hundreds of times and you don’t pay attention to the enormous white stone slabs lining the walls inside. Etched on them, are the names of Yale alumni who died in the nation’s wars, from the Civil War all the way to 20th century. Here’s a photo. 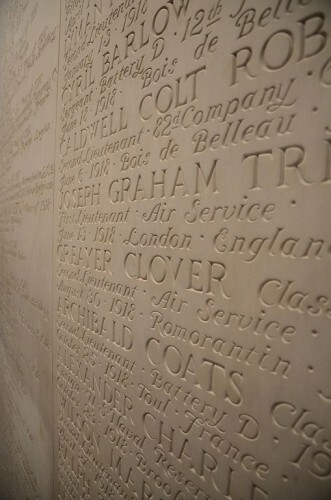 It lists the battles at which the soldiers fell, the units to which they belonged, and their Yale classes. From that, you can estimate what their ages were. Now that I’m older, slower in gait, and no longer rushing to and from classes, I had the chance to linger last week when I was on campus. I read a lot of the names. I wonder what the men were like. So many names. So many young people. A dizzying list that goes on and on, from one slab to another, all around and all above you. Heartbreaking…. Being there made me realize that I’ve taken for granted our veterans and all that they’ve done for us. I hope we can all make the time to find a veteran and to thank him or her. If you cannot, I’d encourage to donate to “Homes for Our Troops,” which builds specially-adapted homes for severely-injured veterans (click here to give). The group gets an “A” grade from CharityWatch for financial transparency and low-costs. My wife and I just made a donation. Today is Veterans Day, after all. Last, but not least: thank you, Mr. Brody, for all of your sacrifice, leadership and service….